While Cape Town’s beaches overflow with holidaymakers during the summer season, Table Mountain remains relatively sparsely populated despite it being voted one of the new seven wonders of the world. There are numerous trails up and around the mountain, from the sedate to the challenging. 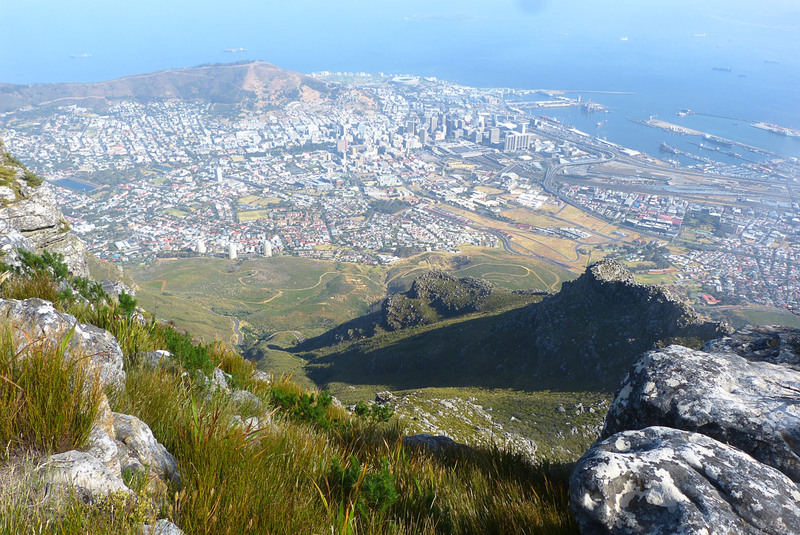 For adrenaline junkies who enjoy rock climbing, the Table Mountain range offers a plethora of opportunities. On the walking side, however, one of the most spectacular peaks immortalized in countless images of Table Bay, is Devil’s Peak, its very topography seeming a challenge to any hiker who owns a good pair of boots. While a stream of people walk up and down the tame Lion’s Head at any time of day – and often at night on a full moon – Devil’s Peak sits in glorious isolation despite its promises of stunning views over the city and bay. It is certainly not an easy walk and hikers would be wise to properly prepare for a mountain ascent and set off early in the day. There are three trails leading to the top of Devil’s Peak. For two of these you have to start from Rhodes Memorial, which is just a short walk or drive away from Mowbray, while the other leads up from Tafelberg Road on the other side. The path we took from Rhodes Memorial leads through old Pine forest plantations before opening onto fynbos, including the shimmering endemic Silver Trees – part of the Protea family – comprises steps that proceed all the way to the King’s Blockhouse on the slope almost directly below the peak of Devil’s Peak. This old house, once built and inhabited by a Cape Town’s forester, is the ideal spot for a short rest or a little picnic before continuing on one of two paths, both of which double back toward the Newlands ravine on the south side of Devil’s Peak. We chose the more moderate path that sticks more or less to the contour rather than the steeper one that brings you to the ravine at a higher altitude. The contour path runs along the Devil’s Peak slop toward Kirstenbosch, through the shade of Afro-Montane forest and crossing small waterfalls. Once at the Newlands ravine the climb starts again, up past the tree line and back in the sun – which is welcome as the air is surprisingly cool at that level despite the city below broiling in 30 degreet heat. At the top of the saddle between Devil’s Peak and Table Mountain, you meet the trail coming from Tafelberg Road which is essentially a stone staircase offering a steep but quick way up. The route from Tafelberg has a magnificent view over the Lion’s Head, Signal Hill and the City Bowl at its feet whereas the Newlands Ravine Path offers a several hours hike through changing scenery. Once in between the two mountains, a steep path leads up to the top of Devil’s Peak. The straining hike, however, is rewarded by a magnificent view from the top. A 360 degree outlook of Cape Town, the Atlantic Ocean and the surrounding mountains makes the exertion all worthwhile.